A 3D rendering of the measles virus, which can survive in the air for two hours after an infected person coughs or sneezes. One case in Washtenaw County and one in Oakland intially tested positive for measles, but the health department announced April 12 that a genotype of those cases came back negative. In addition, officials say an international traveler was diagnosed with measles following a visit to Washtenaw County, during which time he was contagious, but it is unrelated to the other cases. Officials say infected individuals range in age from 8 months to 63 years, and that a majority of the cases involve adults. There has been an increasing number of measles outbreaks in the U.S. in recent years, including 17 outbreaks and 372 cases in 2018 alone. As of March 14, the CDC reports 268 cases in 2019. There are currently outbreaks in New York, Washington, Texas, Illinois, and California. Stateside discussed the Oakland County measles outbreak with Leigh-Anne Stafford, a health officer with the Oakland County Health Department, and Dr. Pamela Hackert, a physician with the department. You can listen to their conversation above. How did this happen in Michigan? The outbreak comes after an Israeli citizen likely caught the disease in New York City, where there is currently a measles outbreak, before traveling to Michigan. The Orthodox Jewish community he visited in Oakland County has acted quickly to get people vaccinated. However, the number of confirmed cases quickly jumped to eight. 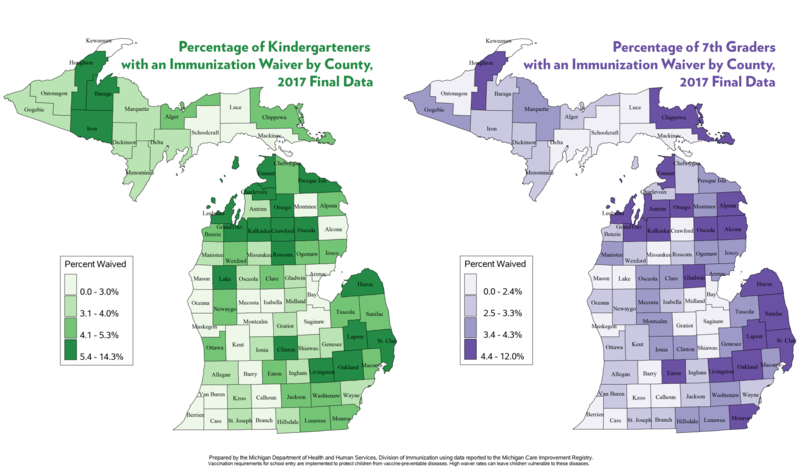 And since Oakland County has a relatively high vaccination waiver rate, health officials are worried. The Oakland and Washtenaw health departments have been updating a long list of possible locations where contagious individuals may have exposed others. (There are no exposure locations for the Wayne County case). Those lists have included multiple Jewish Community Centers, several Krogers, and multiple hospitals and urgent cares. One of the cases announced on April 17 include exposure locations in Kent and Ingham counties. That means a lot of people in Southeast Michigan may have been exposed to the virus. Health officials are asking anyone showing symptoms to call ahead before visiting a hospital or doctor's office, so proper protective measures can be taken. Measles is an incredibly contagious infectious disease, caused by a virus that can survive up to two hours in the air after an infected person coughs or sneezes. "People who are not vaccinated have at least a 95% chance, if they are exposed, of becoming infected with measles," says Dr. Russell Faust, Medical Director for the Oakland County Health Division. "This is an incredibly effective virus." 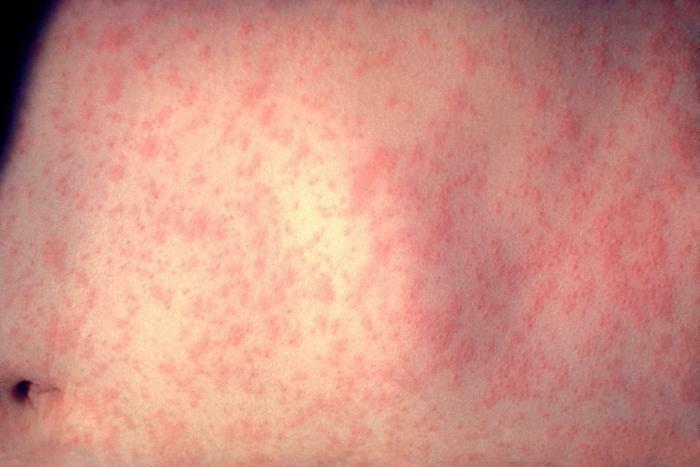 The skin rash on a measles patient’s abdomen 3-days after the onset of a measles infection. Because measles has a long incubation period, it can take up to 21 days for an infected person to exhibit symptoms. Initially, symptoms may include fever, a cough, a runny nose and inflamed eyes. Three to five days after symptoms begin, a patient may develop white spots in their mouth and throat. A flat, red rash typically develops on the face before spreading to the rest of the body. While there's no cure for measles, you can get vaccinated up to 72 hours after exposure, according to the Mayo Clinic. You still might get sick, but "the illness usually has milder symptoms and lasts for a shorter time" with the vaccination. Health officials are also urging people with greater risk (infants, pregnant women, anyone with a lowered immune system) to get an injection called an immune serum globulin, which can help prevent the disease and lessen the symptoms. And doctors can also point patients toward fever reducers and other treatments, which can reduce the chance of death. That risk is approximately 0.2%, though young children have a higher chance of complications or death from the measles. Get vaccinated. The CDC recommends the measles-mumps-rubella (MMR) vaccine be administered to children in two doses, first at 12-15 months old, then again at four to six years old. Teens and adults should also be up to date on MMR vaccinations. It is advised that you check your vaccine record if you were born between 1963 and 1967, because there was an ineffective vaccine available at that time. Otherwise, if you have proof of immunity (written documentation of adequate vaccination, laboratory confirmation of measles, or born before 1957), you should be good to go. But the MMR vaccine is safe, and getting it again doesn't hurt anything. Vaccination doesn't just help you avoid the measles: it helps those around you, too, thanks to “herd immunity.” If everyone who can get the vaccine does so, it also protects those who may not be able to get the vaccine, including infants or those with compromised immune systems. And vaccination is especially important for people traveling out of state, says Leigh-Anne Stafford, the Oakland County Health Officer. Michigan's MMR vaccination rate ranked 29th in the country in 2017, according to the state health department. But several communities throughout the state are outliers with much lower rates. Michigan is one of 17 states that allows parents to opt out of vaccinating their children for religious or philosophical reasons. Although as of 2014, parents are required to “receive education regarding the benefits of vaccination and the risks of disease” before claiming a nonmedical waiver for their child. The statewide average for waiver rates has dropped since that 2014 law, but the rate is still 2.4%. Oakland County, where the outbreak has taken hold, has a vaccination waiver rate of 4.8%. Low vaccination rates affect entire communities. Dr. Nancy Messonnier is the director of the National Center for Immunization and Respiratory Diseases. She spoke before Congress last month in response to the growing number of outbreaks throughout the country. Outbreaks often happen, she says, because some people are hesitant about vaccines, and may delay or refuse to properly vaccinate themselves and their children. "Those choosing not to vaccinate [often] live near each other," says Messonnier. "Some of these are what we call close-knit communities: people who share common religious or ethnic or racial backgrounds and have strong policies against vaccination." You can get the measles vaccine at most pharmacies or walk-in clinics, in addition to your physician's office. Find your nearest provider here. Multiple Oakland and Wayne County health centers are offering vaccinations, including the Oakland County Health Division offices in Southfield and Pontiac. Learn more about those vaccination sites here. The measles vaccine is safe and effective, but if you have any additional questions about the vaccine, you can learn more here. This post was updated April 17, 2019 at 5:05 p.m. The number of confirmed cases in the original March 25th post was eight. The MDHHS said that same night the number had grown to 18, then 22 by the next afternoon. The number of cases rose to 29 in Oakland County and one in Wayne on the morning of April 2, then to 33 in Oakland county on the same day. It has now been confirmed that the youngest with measles is 8 months. It had previously been 1 year. On April 8, the number of cases in Oakland County rose to 39, and one case was confirmed in Washtenaw County. On April 17, two new Oakland County cases and a case in the City of Detroit was confirmed.